I received my Christmas present early this year. I have wanted a KitchenAid forever, but space has always been an issue. It still is, but not as restrictive as it used to be, though not a chef’s kitchen by any means. A great deal came my way and I took advantage (truth be told, grief may have played a role as I was in need of retail therapy – give me something big and shiny my brain said). Bread was my first use. I love this recipe, it is so easy. I was looking for a slow rise bread – they are thought to be easier to digest for people who have trouble with yeast or gluten sensitivities. And it has the added advantage of being super easy and almost fool-proof to make. Instant yeast is a must here, because the idea behind the slow rise is that the yeast has time fully flavor the bread and become more easily digestible. I have switched to single source flours – I used 1/2 white and 1/2 whole golden wheat (it has a nice, slightly sweet flavor). The flavor and texture can’t be beaten with these small-batch flours. Combine all dry ingredients in a mixing bowl until well blended, add water and blend until smooth and forms a loose ball, about 1 minute. Let rest uncovered for 5 minutes. Turn out onto a lightly floured surface and gently knead for two minutes. 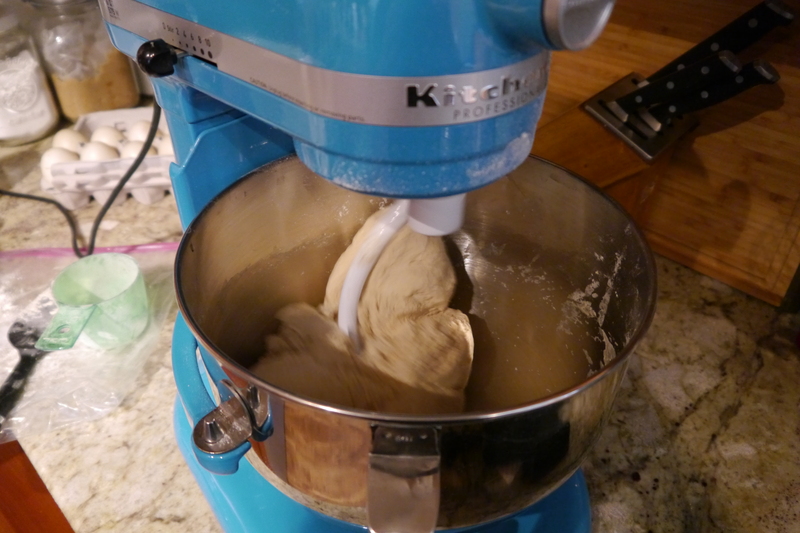 The dough should be smooth, tacky, not dry or sticky. Adjust by adding flour and water as needed*. 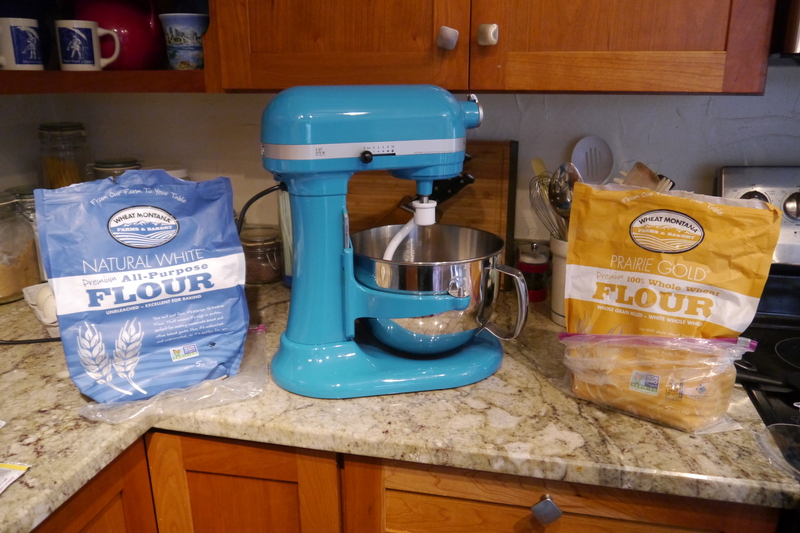 *This is where the new mixer was indispensable – it kneaded evenly and quickly, without any mess, not removing to a floured surface, no hand kneading. I did add a bit of extra water because the whole wheat flour needs more. Transfer to a lightly oiled bowl, cover with plastic wrap and refrigerate for at least 12 hours or up to four days. It makes two loaves. If you’d like to make loaves separately, you can divide into to equal pieces, cover and refrigerate separately. Two hours before baking, remove from the refrigerator. Shape into desired loaf, spray lightly with oil and cover loosely with plastic wrap. Let rise about 90 minutes until it’s increased 1 ½ times its original size. Preheat oven to 450 degrees and remove plastic from bread. 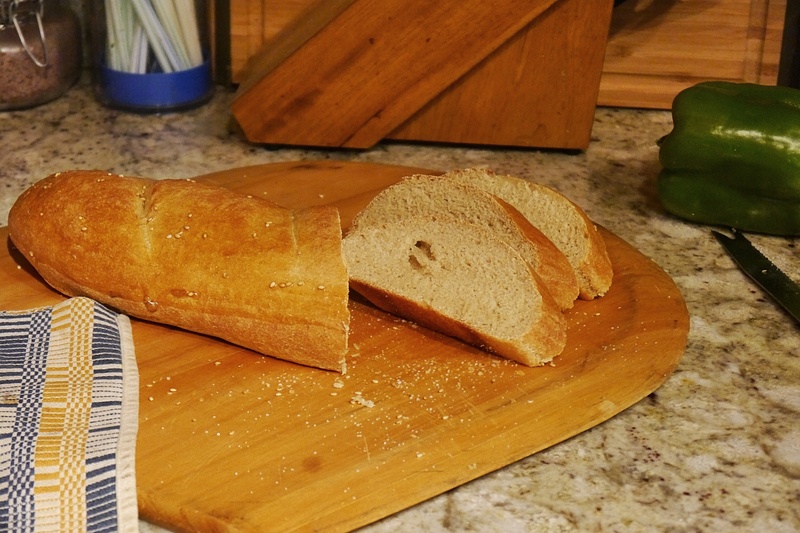 Just before baking, score with three slices across the bread with a sharp knife. Place on a lightly oiled baking sheet and place in hot oven. I add sesame seeds on the baking sheet and place the loaf on that so it doesn’t stick and has a nice sesame seed crust. Add a tray of ice to a baking sheet and place on the rack underneath the bread to create a steam bath for the bread. This will give you a crispy, chewy crust. Bake for 15 minutes, rotate pan and bake an additional 15 minutes, or until the bread reaches an internal temperature of 200 degrees F. For crisper crust, turn off the oven and leave the bread in an additional 5 minutes. Remove to a breadboard and let cool for 45 minutes (ok, seriously, if you can wait that long, you’re a better person than I – I’ve scorched my fingers more than once sneaking a fresh hot slice). I have some great Beef and Barley Soup (recipe here ) to serve with it.